A common condition, particularly in the aging population, is a breakdown of the cartilage in a joint mainly as the result of mechanical stress, injury, lifestyle, diet and general wear and tear. When degeneration occurs, the cartilage becomes thin and erodes, which in turn impairs movement, increases friction in the joint and causes pain. This condition is often more likely to occur in weight bearing joints, such as the hips, knees, and the spine. Osteoarthritis is more likely to affect women than men with an estimated one in three adults in the United States, and one in eleven Australians having some degree of degeneration in one or more joints. In osteoarthritis, the surface of the joint becomes rough and damaged, and surrounding injured tissues release certain enzymes from cells which can further break down the cartilage. When the cartilage is broken down the bone has little to cushion and protect it, and subsequently bone may be exposed which can lead to further complications with cysts and bone spurs developing around the outside of the bone. Bone spurs are often seen in x-rays near the damaged cartilage, particularly in the neck and lower back. These can also be extremely painful. Altered movements creating more stress on other joints, leads to stress and consequent injury to those structures. Tendons, ligaments and muscles holding the joint together become weaker as more strain is placed on them, and tissue injury is more likely to occur with less force than before. Whilst the pain of osteoarthritis is often dull and mild initially, as the degeneration of the cartilage worsens the pain and aching can intensify, particularly with weight bearing movements and activities. Often, when bone spurs occur, the affected joint will appear enlarged and hardened with swelling in surrounding tissues. Movement can be restricted and once easy activities such as walking can become harder. As the cartilages on each bone end becomes rough and starts grating against each other, audible clicking and grinding can be heard. Read a more medical – in depth explanation. Diagnosis of osteoarthritis is often by x-ray and symptomatic differential diagnosis. Treatments include adequately resting the joint, limiting stress on the joint and using an aid to facilitate movement. Often, medical intervention can include the use of anti-inflammatory drugs, corticosteroids, and synthetic synovial fluid injections. Surgery to replace the affected joint can be done but is usually a last resort option. 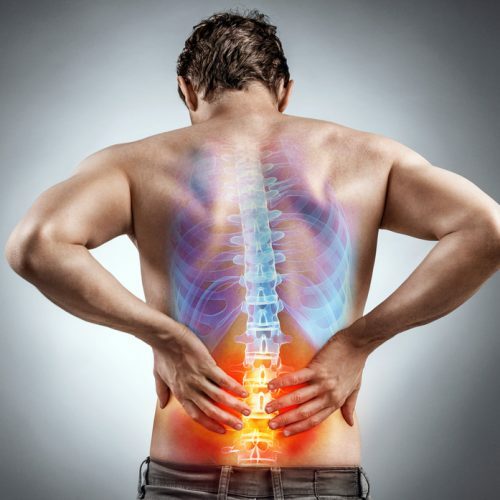 Osteoarthritis in the spinal column can be especially painful and restrict daily activities. By using the Nubax Trio at home, osteoarthritis can be slowed down and even improved. The Nubax Trio uses axial decompression to rebuild vertebral discs, relieve pain and improve mobility. By improving blood flow around the spine, Nubax Trio may also aid in the healing process in already degenerated vertebral cartilage. By pulling the shoulders and the hips in to alignment with the spine, altered postures due to mechanical restrictions can be successfully realigned to the correct position. Osteoarthritis varies in degree of severity. For sever osteoarthritis it is recommended to ask a qualified health professional about the effectiveness of using back decompression treatment.